The house is open for public viewing and includes an upside down garage, children's bedroom and even bathroom. Over the years, there have been several fictional portrayals of upside houses, though those usually involved simply placing the items in an otherwise normal house onto the room's ceiling. 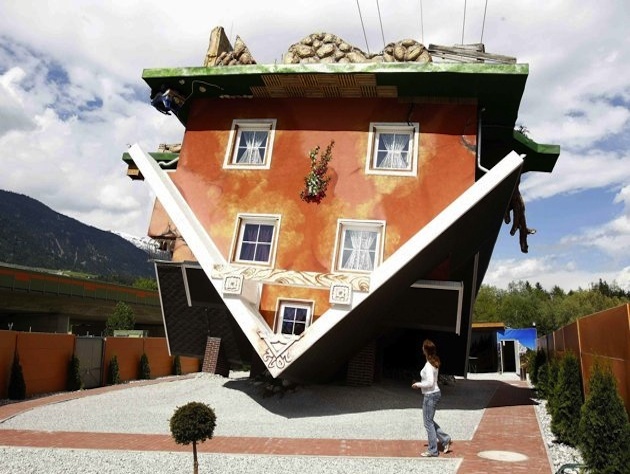 As you can see from the photos, this is a truly unusual creation, where the actual house itself, including the foundation, appears to be fully turned on its head. If you want to see an even larger version of an upside down spectacle in nature, you could always check out the Pic de Bugarach in France; a mountain whose peak is believed to have turned on itself during an eruption thousands of years ago, creating an "upside down" mountain.